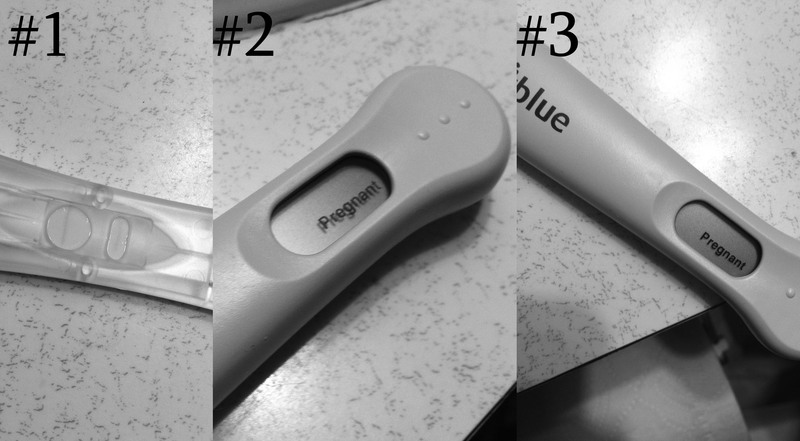 It was truly a miracle to see an extra line on the pregnancy test. A complete miracle that I, and everyone around me, thought would never come soon enough. It has been 7 1/2 years since we’ve been wanting to expand our little family and no glimmer of hope ever was so bright as was on Dec. 15th when we got 3 positive pregnancy tests! Dec. 15th: I came home from work exhausted and ready for bed but couldn’t sleep b/c my back had been killing me for the past few weeks and I had no idea why. I was also 2 1/2 weeks late for my period…wanting AF to rear her head b/c I wanted to start trying again for the next month. I only had a few months left to try before the hubbs was getting dep. for work. I remembered I had one old test under the sink so what do you know…I couldn’t resist. Well I gave it 10 min to set b/c I don’t want to look too soon as to be completely devestated when I just knew it was going to say BFN! 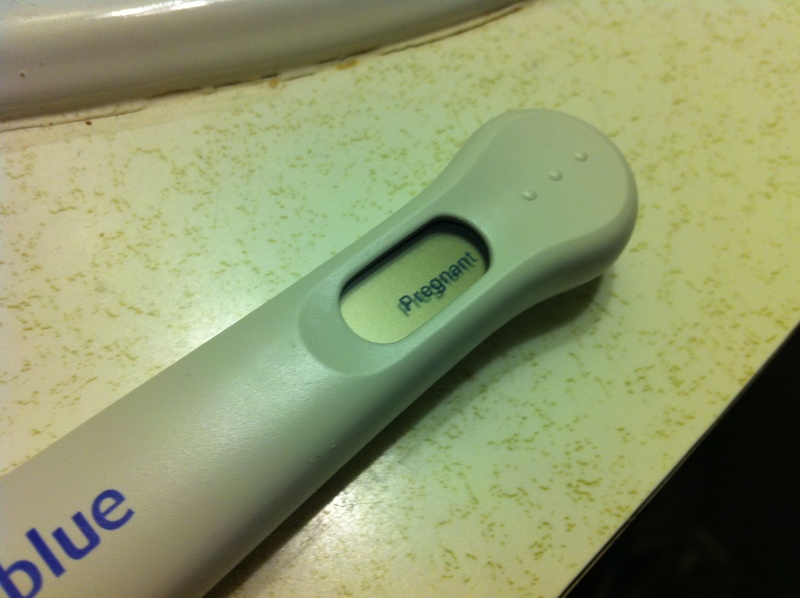 Well the prego line came up light and the control line never came so I was freaking out. I called a friend to determine that I was just insane and reading the test wrong but I couldn’t help myself…I drove my wrecked car (that happened earlier that day) the 1/2 mile to the closest CVS @ 1145 to get another test. I was prepared with a huge bottle of water, candy, and a box of 3 digital tests…now for the pee! 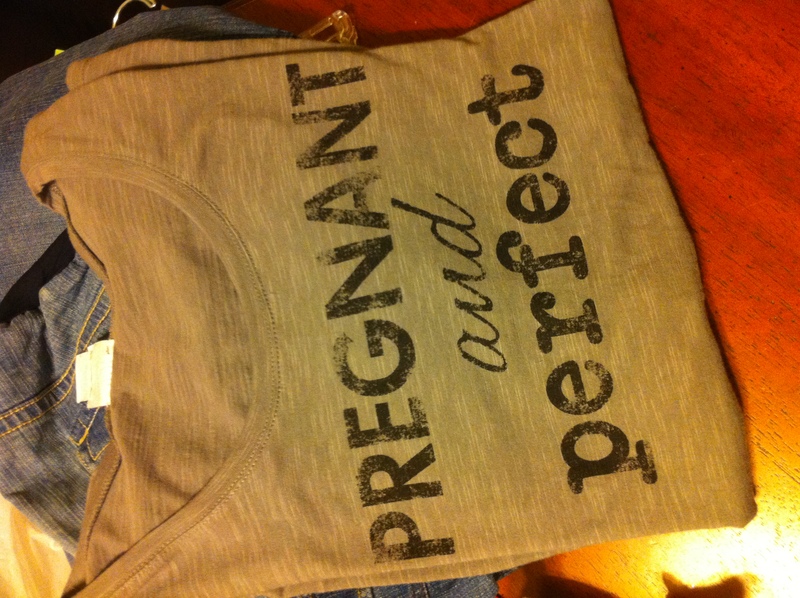 10 min later I couldn’t wait, I had to take a test and sure enough it said: PREGNANT! There was actually no “!” at the end but I sure had to imagine it there. Dec. 16th: Gabe came home @ 1am and I told him to look in the bathroom b/c I had to tell him something. Mind you I wrecked the love of his life (the other red head…his S2000), he thought I broke something else and was preparing himself to not kill me. He didn’t see the two tests on the counter so I pointed downwards and he looked at me like I was lying!! He said,”That’s not your pee…and is it too soon to start planning the tree house”! Sure enough he cried and was too stinkin excited. I didn’t believe it yet so I took another test 30 min later and sure enough within 1 min it said: PREGNANT! Well sleep was sorta out of the question but the morning wouldn’t come quick enough b/c I wanted to check my blood to confirm! I made an appointment for that afternoon (no insurance till Jan 1st) and paid in full for a stinkin blood test to check my Progesterone (I’ve been previously lacking in this hormone) and my betas. On my way back to work from the doc office I stopped to get another test (different brand just to make sure the tests weren’t tainted)…and of course it said: PREGNANT! Dec. 17th: That Friday we had our company Christmas lunch and trip to bowling and I was anxiously awaiting confirmation from the doc office that I was preggers. Sure enough during lunch they called with my #1 Beta: 3260, I was 6wk 4d! I was sure I was having twins 🙂 So we schedule another blood draw for Dec. 20th to see if the numbers will double. We had originally decided that if we were to ever get prego we would wait till 13-14 wks to tell anyone b/c of complications and to save my emotions just in case something went wrong but I told him that I wanted the important people in my life to know b/c I wanted them to be there for me just in case something bad did happen. So as soon as I told him that he called his mom, he couldn’t wait! After I got home from work the hubbs and I went to Babys-r-us to pick out some photo frames for our families…and just b/c I was so excited!! There was a real crying moment b/c the hubbs started to feel this was real and was so excited to become a father. He wanted to do so many things and had already started planning on projects to do with our baby on the way. 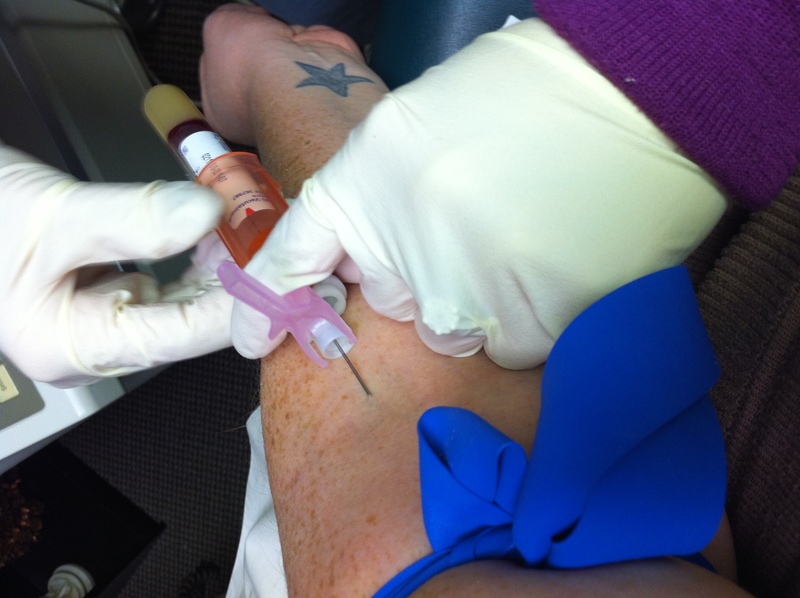 Dec. 18th: This weekend was the weekend we go to visit my family for Christmas so we wanted to surprise them with our news even though we hadn’t know for too long and we had the only confirmation of a blood test…we couldn’t wait b/c this was a 7 yr miracle waiting to be shared! We gave my dad a photo frame with the pic of the test in it, he opened it in front of all my aunts and uncles and was completely stunned. Later on that night we went by my mom’s house and did the same: a photo frame with the pic of the test in it. I actually video recorded it and it’s priceless! Dec. 19th: Over the past week I had been noticing the expansion of my waistline…thinking I had just had too many tacos that day but it would never go away. Well it was the preg. bloat and nothing would fit me comfortably so we went on a lil’ shopping trip! Dec. 20th: I head back in for another beta test and keep my fingers crossed!! Dec. 21st: #2 Beta: 4285 It didn’t double but it still went up, I knew this was a grey area b/c it was bad that it didn’t double in 4 days but I also knew it was still a good sign that it went up. They prepared me for the worst but I kept hope that anything is possible and that God wouldn’t be that cruel to me to take 7 years to fufill a promise and then 7 wks later take it away. 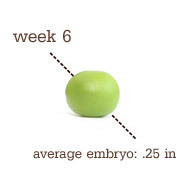 Well we schedule a sonogram for the following day to check to see how things were going inside. 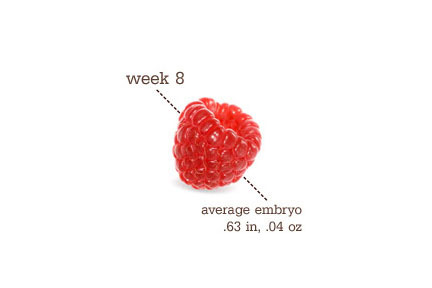 Dec. 27th: 8wks, internal ultrasound showed no heartbeat and baby not growing. My amazing doc prepared me for what was to happen. I love her and think she was a Godsend b/c she held my hand as I cried and told me it was going to be okay. It was a good sign that we got pregnant to begin with but that either my body wasn’t ready or that something was wrong with the baby and that it was better that it hadn’t survived – things would have just been hard and cruel for the baby had it lived with physical/mental disabilities. We left the office with no bills, the doc didn’t charge me for the visit/sono, w/ no insurance for another week this was one of the sweetest things someone could have done for us…considering she’s just my doc. I don’t remember this day completely b/c I was mostly in shock, but worse I was angry. Angry at the world, angry at my body, and mostly angry at God. Wondering why in the world would he tease me this way…give me the joy of a baby that I’ve longed for for so long and then viciously take it away. I just didn’t understand. I cried myself to sleep with the hubbs holding me tight. Dec. 28th: The day when all hell broke loose. I started to bleed out, everything was on it’s way down the toilet, literally and figuratively. It was all going to be over soon, all back to normal in a couple of weeks. I was passing clots everytime I went to the bathroom. Dec. 29th: The worst day of pain, I had never felt this much pain before…I couldn’t get out of bed, I couldn’t turn over, I couldn’t breathe. I was in so much physical pain it sort of numbed my emotional pain. As of today everyone knew (that we had told of the pregnancy so far) of our tragedy and no one had come to my rescue. I had a couple of texts and messages telling me that they’d be there for me if I needed them to, but no one made themselves known and made them a part of my pain. I can understand them not knowing what to say or how to approach the situation but to sit back and not offer any words of encouragement? What sort of friends did I have, or the lack there of? An amazing friend brought me comfort food (this is where the eating began) and words of hope, a hug, and a shoulder to cry on. I am forever in debt to her for her generosity. Dec. 30th: We head to Cali to visit family and get away from reality for the next week. Jan 1st: Nothing would have prepared me for such a sight. The baby came out. I screamed for the hubbs and we shared a moment together that I will never forget. He held me so tight and told me it was going to be okay, that soon it would be over and that he would always love me. We said our goodbyes. Jan 8th: The bleeding had stopped and I’m feeling back to normal again…almost as if nothing happened. Like I was never pregnant to begin with. Back to square 1, a barren wife unable to give the hubbs children. We head back home to reality, work, friends, and an empty nest. Jan. 10th: This was a hard day, I guess it was the first day back to reality and back to work to see 2 women who are pregnant and their looks of sympathy…I wasn’t ready for that! My dear friend who brought me dinner 2 weeks ago invited me to dinner and a chat so I went knowing that I’d probably cry the whole night and sure enough…I did. She brought along another friend that had been through a similar thing years ago, she didn’t know what was going on with me but as soon as I told her she cried for me and tried to offer any sort of words of encouragement. The one thing that really stuck and that is helping is,”You will go to bed one night and realize you didn’t cry as much today as you did yesterday…and then you’ll believe you can get through it”. That is the one thing that I’m holding onto, hoping that as each day passes, I cry less. Jan. 11th: That same person who offered me advice from one mom to another called and said she was dropping by for a small talk to check in on me. Granted I know her but I’m not close enough with her for this to happen. 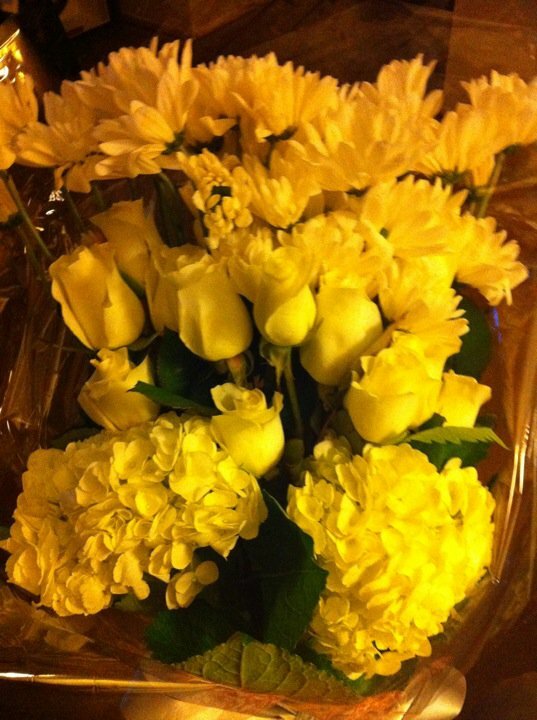 She showed up with beautiful flowers and a kind heart that this too shall pass. I love that she has been exactly what I needed and she did it out of love in her heart for our God b/c she doesn’t know me and she doesn’t know how my heart has been aching for the past 7 years! -So my conclusion and my feelings are all over the place, I don’t know when or if I will go back to the Serena I once was but I will definitely always love my baby that I never met. I will trust in God, even though I don’t want to right now…I know there is a plan for me. I have to trust that there is a hope and that He wouldn’t let me desire the impossible. I have to be okay with this, I know I can’t change it but I’m just a bitter woman. I’m angry at my “friends” and family, but the hubbs keeps reminding me that they probably didn’t know where to start and how to comfort. I say bologna!! I just have to learn to forgive and learn to move on and that maybe tomorrow I won’t cry as much as I did today. Previous This gives me hope: Next Life as we know it. Serena reading this made me cry. Really you and I have gone through some of the same things. I am always here to talk. I know we do not personally know each other but there is strength in talking. Talking helps get through a little bit of pain. You made me cry. Thank you for your encouragement…it’s needed more than you know!